Little did Yamada-Sensei know in 1964 that 50 years later, his life’s dedication in the “Big Apple” would inspire two aikido students, Dan and Nina Hayes, to connect in the “Little Apple” (Manhattan, KS) in an aikido wedding. 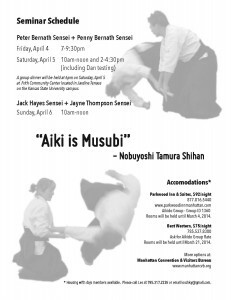 This aikido family actually started in 1972, when Peter Bernath started his aikido career under Yoshimitsu Yamada Sensei at New York Aikikai. Eventually in 1979, Peter met Penny at the Florida Winter Seminar. There, Yamada Sensei asked them to open Florida Aikikai, with Peter to be the chief instructor and Penny to be the dojo manager. 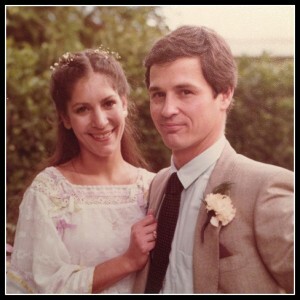 So, in 1980, Florida Aikikai was officially opened, and 2 years later, Peter and Penny Bernath Sensei married. 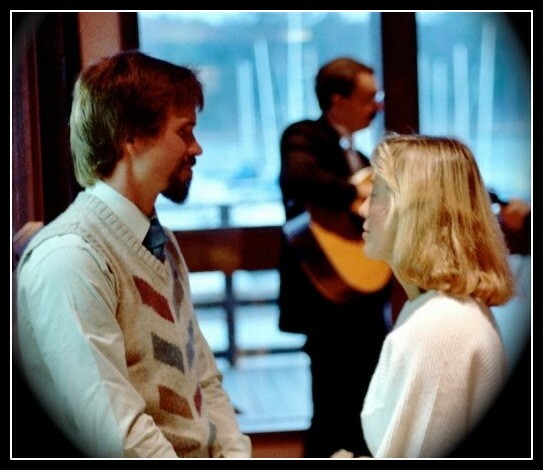 Then in 1987, two people named Jack Hayes and Jayne Thompson joined Peter and Penny Bernath Sensei in Ft. Lauderdale, Florida, to allow their child, Dan, to participate in children’s classes. 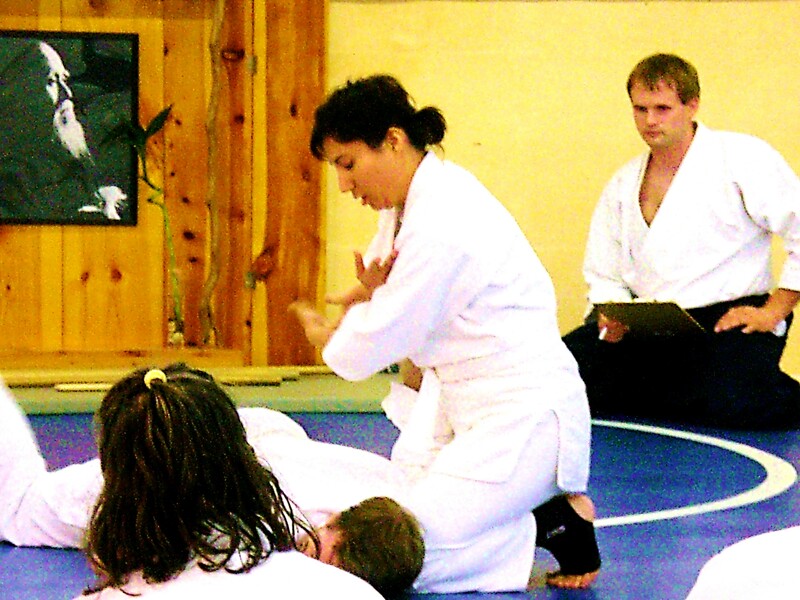 Dan Hayes (circled) with Peter Bernath Sensei leaning on his shoulder. 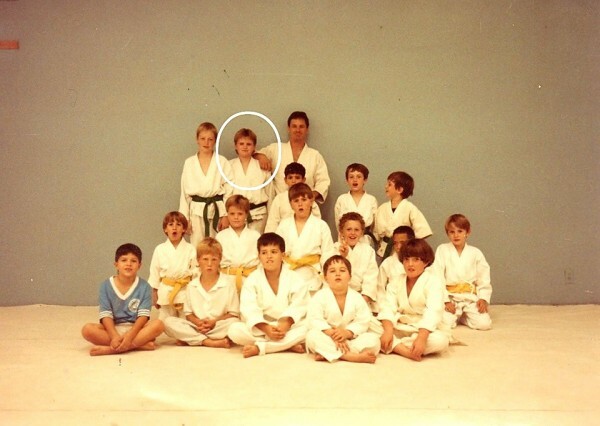 Dan’s younger brother, Matt was also in Aikido at the time. He is second from the right, second row from the back wall. Jack Hayes and Jayne Thompson Sensei moved to Manhattan, KS, in 1994 with their family. 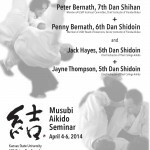 They formed KSU Aikido, and Dan continued aikido under his parents. Dan Hayes, his stepmother Jayne Thompson Sensei, Penny Bernath Sensei (guest seminar instructor), and Dan’s father Jack Hayes Sensei. By 2002, Dan had been practicing for 15 years. Then, a freshman veterinary student, Nina, came along, looking for an activity outside the classroom and hospital walls. 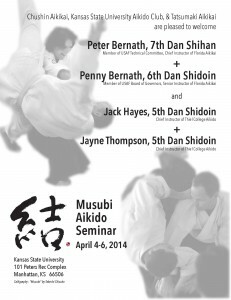 She ended up on an aikido mat on the Kansas State University campus with Jack and Jayne Sensei (Dan’s parents) as her instructors. 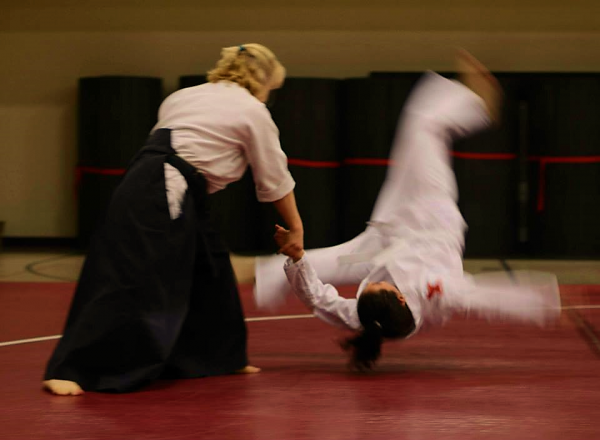 Nina didn’t have any martial arts experience at all and wasn’t sure if this “aikido thing” was the right choice, but was told, “just keep coming to practice.” And she did. 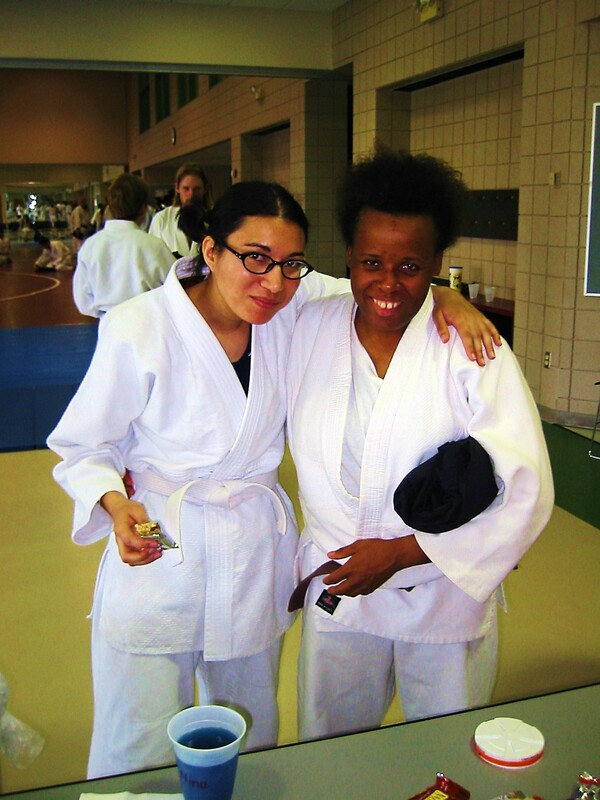 Nina’s first seminar, 5 months after starting aikido, was instructed by Yamada Sensei and Peter Bernath Sensei at Kansas State University. 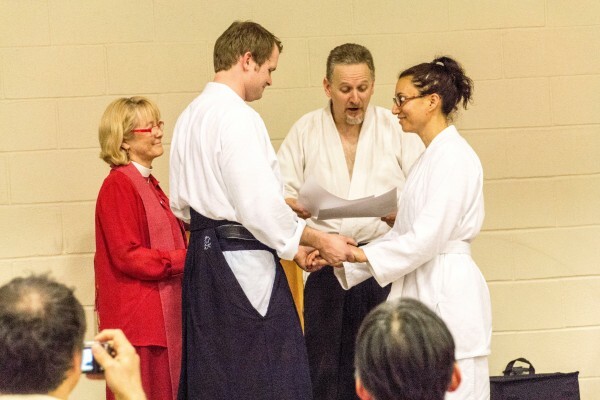 By the time Nina graduated, Jack Hayes and Jayne Thompson Sensei had moved to Minnesota, and she was studying with their son, Dan, the new head instructor of KSU Aikido and the newly formed Tatsumaki Aikikai community group. In 2007, however, Nina moved to Omaha, NE, for work. Dan followed her there, where he formed a new dojo, Chushin Aikikai. He also continued on as the technical director for KSU Aikido and Tatsumaki Aikikai. And Nina and Dan “kept going to practice” – regularly in Omaha, and making a 3 hour drive about once a month to Manhattan, KS… until 2013, when Dan and Nina became engaged. Engagement photo taken by LQ Photography. With much support from their dojos in Omaha and Kansas, Dan and Nina Hayes were married during the lunch break of the Musubi Aikido Seminar this past April. 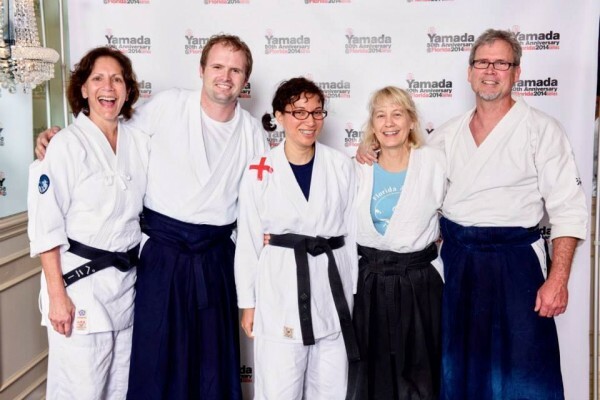 Dan and Nina were honored to have their teachers, Peter and Penny Bernath Sensei, and Jack Hayes and Jayne Thompson Sensei instruct at the seminar. There’s nothing like being uke for your new mother-in-law as she demonstrates a technique for the seminar! Photography by Stacy Smith. 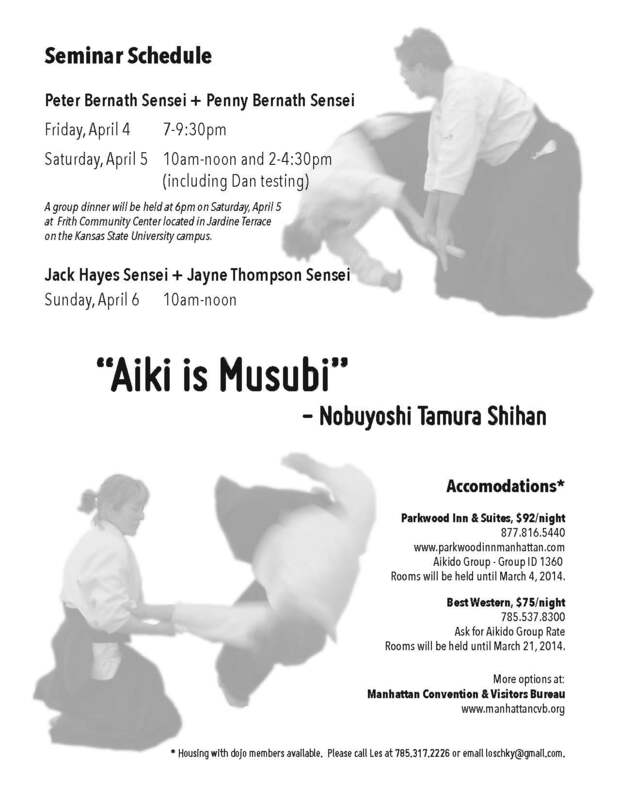 Thank you, Yamada-Sensei, Peter and Penny Bernath Sensei, Jack Hayes and Jayne Thompson Sensei, and all our aikido friends and family for helping a new “aikido family” start in 2014!! 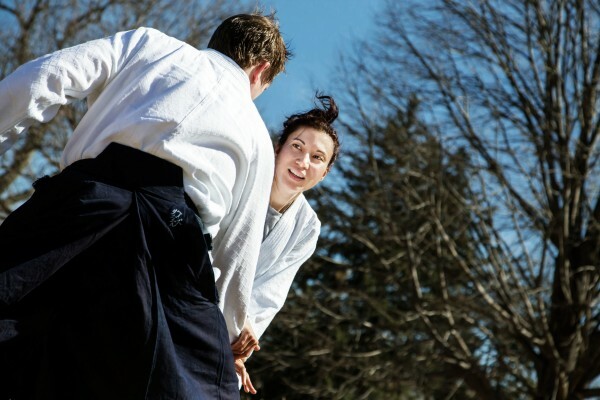 We look forward to many more aikido memories together in 2015 and beyond! !